I try not to see the movie until I have read the book. So, I spent the week reading the book and then I saw the movie. I wish someone had told me I didn’t need to read the whole thing, the movie covers only 1/3 of the book. It was a good read. The movie, on the other hand, didn’t really start until Gollum made an appearance. It was all visually beautiful, but it didn’t move until two hours in. I was pleased to discover that my favorite part of the book was also my favorite scene in the movie; The riddle contest between Bilbo Baggins and Gollum in the Troll Kingdom. Both book and movie version were laugh out loud funny. Come back later this week and read my SQM post on The Hobbit. I also saw Skyfalls. I went to the movies with my parents and then at dinner learned their first date was a James Bond movie. How romantic. My mom informed me that my dad had taken 2 other girls to see the movie, as well. But, she married him anyway. What movies have you seen lately? Did you see The Hobbit? What did you think? Fess Up Friday: I Like Wearing Old Lady Shoes by Cynthia at Read is the New Black – Have you found your niche when it comes to writing? What Writing Step Are You Afraid Of? by Jami Gold – I am afraid of Writing Query Letters, but I think my reasons are off base, how about you? 17 Signs You’re Actually, gasp, an ADULT by Paul Angone at All Groan Up – I am living #3 right now. But, I haven’t seen it in 5 years. Appreciating Art by Tasha Seegmiller – Have you ever taken a scene from your favorite piece of art and wrote a scene? I wrote a scene that took place in Van Gogh’s Iris in a Field. It turned out pretty good. Give it a try. January 16th is the first meeting of the Progressive Book Club. An online book club hosted by M.L. Swift. Click on the badge for more information. HOW NOT TO WRITE A NOVEL BEGINNING. In less than 300 words, I want to see your idea of the WORST beginning you can possibly write. The funnier and more creative you are, the better. To make it easier for me, you have the WHOLE of January to enter, but you must please enter the SPECIFIC entry link into the linky list below. For information, click on the badge. Both events will occur every month and you can join anytime. Yeah, that part was funny, too. I also loved seeing Frodo in the beginning. I am a huge LOTR fan. Definitely looking forward to the next movie. Thanks Sydney for the shout! Honored. Hey Paul. No problem. The post kind of depressed me, but I guess it’s time for us all to grow up, right? Those moments when you catch his blue eyes he is mesmerizing and I felt so sorry for him. I really enjoyed the book, too. I love Peter Jackson’s visual take on all of Tolkien’s books, I think that it is breathtaking. Hats off to New Zealand as well! Yeah, Peter Jackson is brilliant. And, the hint of Smaug was enough to make me excited for the next two. But, if the last 20 minutes was any indication of the pace of the last two, it is going to be amazing. Thanks for stopping by Rai. Sydney – Finish reading the book and you’ll have the next two movies covered! I’m a movie buff, but not a movie goer. Too expensive, and I’d rather wait for it to be released on DVD or HBO or something. It’s usually within a year after theaters. I do manage to squeeze a movie in if it’s something that I have to watch on the big screen – Harry Potter movies, for instance. Thanks for mentioning the book club. It’s an idea that I hope to see grow. I’ll see you Wednesday! I spent the last five years seeing maybe a movie a year. Everything I saw, I rented from iTunes. But, I love watching movies on the big screen. Looking forward to seeing what book you pick for Book Club. Hey Sydney, there’s three movies, so you don’t need to read the whole book… Wait, too late! I really enjoyed it, A little slow moving, but it was so beautiful to watch. It was like spending time with a familiar friend. Yeah, thanks Alex. 😉 Especially seeing Old Bilbo, Frodo, Saruman, Galadriel and Elrond. 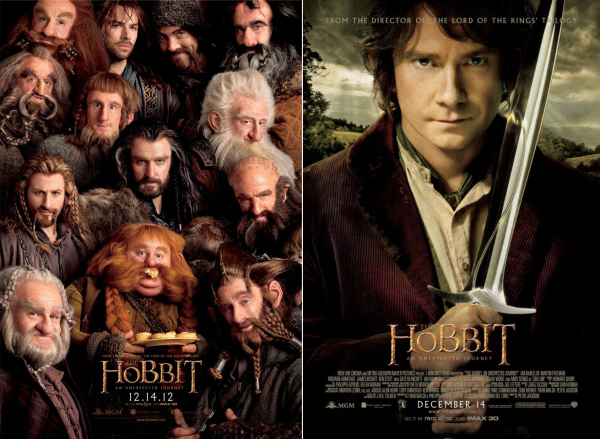 Funny, they didn’t age, but Bilbo did. The ending was enough to make me super excited about the next installment. I loved the movie and the book. I’ve heard a lot of people complaining about the three movies. I have no problem paying for threee movies like this.